Researchers report a case of a patient with multiple adenomas and a family history of young-onset diabetes and hepatocellular carcinoma. They found these to be caused by a mutation in the HNF1 homeobox A gene (HNF1A), which caused maturity onset diabetes of the young type 3 (MODY3). Tom J. Harryvan et al evaluated a 21-year old woman for treatment of multiple adenomas in the liver. She had giant cell hepatitis at the age of 6 months, and was diagnosed with insulin-dependent diabetes mellitus at the age of 13 years. Her family history was positive for diabetes and hepatocellular carcinoma (see figure). The patient developed multiple liver adenomas at age 16 years—selective arterial embolization was chosen to treat the larger adenomas. Despite this treatment, magnetic resonance imaging analyses showed extensive hepatic adenomatosis, with the largest adenoma, located in the right lobe, larger than 8 cm. The patient had no active symptoms and physical examination only revealed hepatomegaly. She had increased levels of alkaline phosphatase (626 U/L; normal range, 0-115 U/L) and gamma-glutamyl transferase (208 U/L; normal range, 0-55 U/L), with slight increases in aminotransferases and altered glycemic control (hemoglobin A1c 7.7%). Because the patient had a family history of hepatocellular carcinoma and young-onset insulin-dependent diabetes, Harryvan et al performed a genetic analysis. They determined the patient to have (MODY3), based on the identification of a mutation in the hepatic nuclear factor 1a (HNF1a) gene (c130dup,pLeu44fs). HNF1A is a transcription factor that functions as a homodimer to regulate expression of several liver-specific genes. HNF1A encodes a tumor suppressor that is inactivated in pancreatic tumors and hepatocellular carcinoma. Variants in HNF1A cause MODY3 in an autosomal dominant manner. MODY3 is characterized by hepatic adenomas, as observed in this patient, and familial noninsulin-dependent diabetes mellitus (NIDDM; 125853) with an early age of onset (childhood, adolescence, or young adulthood under 25 years). 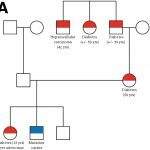 Genetic analysis detected the mutation in the patient’s mother (who had diabetes) and a sibling (no symptoms). Harryvan et al state that suspicion of MODY3 should arise when there is a family history of diabetes and liver adenomas or hepatocellular carcinoma. It is a challenge to manage these patients, because adenoma bleeding (18% of cases) must be prevented, along with progression to malignancy (4% of cases). Due to the diffuse nature of this disease, surgical intervention is often not possible. Selective arterial embolization can be used to target larger adenomas, but this treatment was not successful in this patient. The authors write that she is under consideration for liver transplantation because of the risk of bleeding and history of liver cancer in family members. Screening of affected family members is recommended for patients with this disease (biennial abdominal ultrasound examination and yearly fasting glucose monitoring). What are the Effects of Anticoagulants in Patients With Cirrhosis and Portal Vein Thrombosis?